Taiwo, B.J. ; Akinkunmi, E.O. & Omisore, N.O. The leaves of Ritchiea capparoides var. 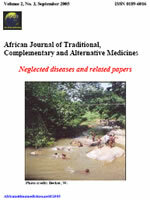 longipedicellata (Capparidaceae) is used in ethnomedicine in South-Western Nigeria to treat infectious and parasitic diseases. This study was aimed at identifying the compound(s) that are responsible for the antimicrobial and antiplasmodial activities of the leaves and also to contribute to the chemistry of the plant species. A 70 % aqueous ethanolic extract of the leaves of R. longipedicellata was subjected to repeated liquid chromatographic methods on silica gel, Lobar RP-18 column and Sephadex LH -20 to isolate a Draggendorf positive compound. The compound was identified by 1H and 13C NMR, ultra-violet spectroscopy and polarimetry. The antimicrobial activity of the compound was evaluated using the microbroth dilution method while the antiplasmodial activity was carried out according to Trager and Jenson (1976). The minimum inhibitory concentration (MIC) was expressed in mg/ml. The isolated compound, leavo- isomer of stachydrine, inhibited the growth of Escherichia coli NCTC 8196 and Staphylococcus aureus NCTC 6571 at the MIC of 5 mg/ml. In the anti-malaria assay, the compound had inhibitory activity with the concentration required to cause 100% lethality being 0.667 mg/ml. Conclusion: The antibacterial and antiparasitic effects of quaternary ammonium compounds are well documented. However, this study is the first report of the presence and biological activities of this compound in this plant species which may justify the ethnomedicinal uses of the leaves.